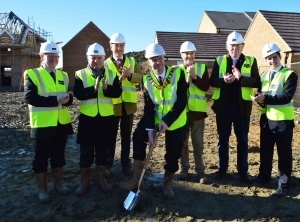 Building work has started at Priors Hall Park in Corby on the first 8 of Electric Corby’s new Zero Energy Bill homes – new homes with no energy bill guaranteed for 2 years. And to mark this important development Electric Corby and their partners officially broke the ground of plot 274. The honour was given to the Deputy Mayor of Corby, Cllr Anthony Dady who is photographed with the partners looking on. Having secured Growing Places funding from SEMLEP last year, Electric Corby has worked with the developers of Priors Hall Park and energy experts to finalise plans for these 3 bed semi-detached homes that have been described as ‘traditional with a twist’ – traditional in design but with an important twist the latest technology built in for generating and conserving electricity and heat, saving the homeowner an average of a £1,000 per annum in energy bills. With the addition of a home automation system that enables homeowners to remotely control and manage their homes lighting, appliances, heating and hot water, Electric Corby is guaranteeing that homeowners will have a net energy bill of zero for 2 years* . Thereafter, residents will be well placed to fend off ever increasing energy prices with a home that not only conserves energy better than most, but also generates much of its own needs at no cost to the bill payer. Electric Corby has worked with leading edge renewable energy technology company Newform Energy and ground breaking home automation firm JSJS Designs to develop a package that makes living with these new ZEB homes entirely familiar but refreshingly future focused. Picture the difference between a car from the 80’s and a car from today – it looks and feels familiar but there are amazingly clever things going on underneath that make it massively more efficient and a real 21st Century experience to live with. Construction will continue over the winter, with the first homes ready to occupy in the spring of 2014, but you can reserve one now at the Priors Hall Park “Future Centre”. 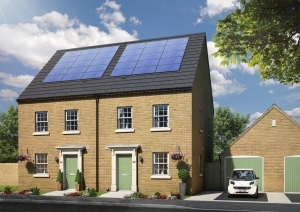 And best of all if you’re one of the first 2 to reserve a ZEB home, it will cost £165,000, no more than a standard equivalent 3 bed semi-detached at Priors Hall Park. Joe Dickinson, Project Manager at Electric Corby said; “Although we’ve been working for 2 years to reach this point the timing couldn’t be better as people are faced with ever escalating energy bills Electric Corby is delighted to be offering the choice of a home with no energy bill guaranteed for 2 years. 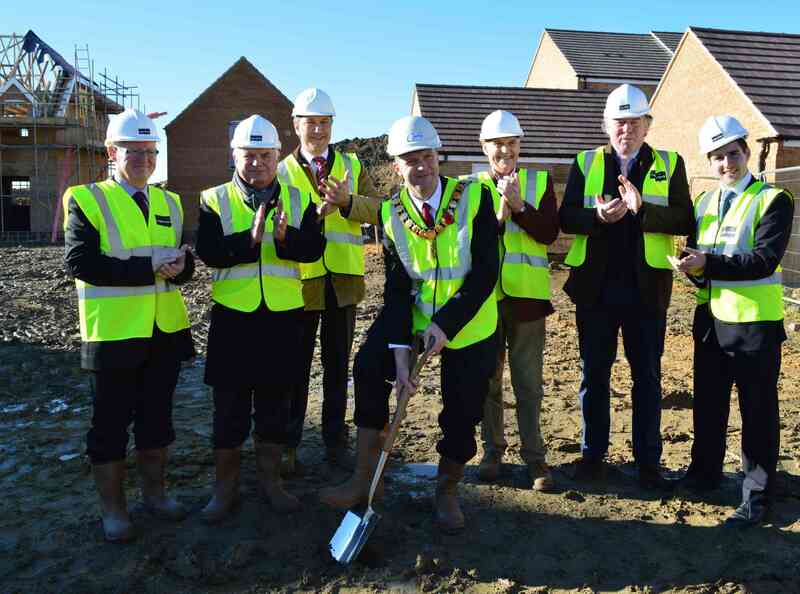 With Newform Energy, Lagan Homes, Bela Partnership and the backing of SEMLEP and Corby Borough Council we’ve brought together a strong team to deliver these homes and the unique benefit they offer to homebuyers”.